We are incredibly humbled and excited that two of our beers were selected for medal at the 2015 Great America Beer Festival. We want to thank and congratulate all of our fellow Washington state breweries who received medals and who have helped us in indescribable ways. This industry is truly a family and we are excited to share this award with our brewery family! We will be announcing a party at the brewery to celebrate on October 9 – more details come soon! To purchase either of these beers, please visit our “retailers” section. Below are some official details of the festival and our brews that received an award. Presented by the Brewers Association, GABF is the largest national beer competition that recognizes the most outstanding beers produced in the United States. The top three winners in the competition’s 92 beer categories were announced September 26 at the Great American Beer Festival awards ceremony held at the Colorado Convention Center in Denver, Colorado. 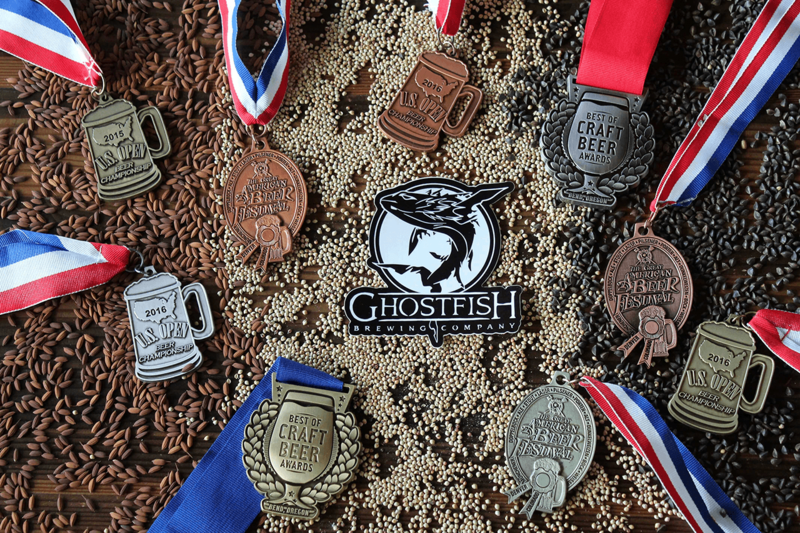 Ghostfish Brewing Company received a gold medal in the Gluten Free beer-style category for its Watchstander Stout, a rich and roasty ale is made from 5 different roasts of artisan gluten-free millet malt, for a complex and satisfying true stout flavor. They also received a bronze medal for its Grapefruit IPA, a lively and bright, bracingly bitter, and eminently refreshing IPA brewed with grapefruit peel. Ghostfish Brewing Company is the only dedicated gluten-free craft brewery located in Washington state, with a taproom in Seattle’s Sodo neighborhood. can I buy your beer on line? OMG!!!! Your IPA is FANTASTIC a real beer! Then the Shrouded Summit Witbier……….how to top these? I found “your” beer in Issaquah, PCC store. WHY are you not selling to stores east of the casscades? Where do you get your groused malted millet and buckwheat? I tell all my patients (gluten intolerant) to try your beers…..all say the same WOW! It must have taken trial and error for some time to come up with awesome brews! Thank you for your determination!!!! ps next time in Seattle I am coming to the “tap” room!! !